I love Sussex. I really do. But there’s one thing that my hometown needs to sort out and that’s public transport – more specifically the buses. Quite frankly, it’s rubbish. I feel quite spoilt up here in Oxford. Here the buses are on time, well, kind of. At least I know when they’re supposed to turn up. Thank you up-to-date digital timetable. I am slightly biased though. Truth be told, I’m not a huge fan of bus travel. Mainly because I can’t do much except look out of the window or talk. Getting travel sick is never fun. I do like train travel. When I was in Sussex, my commute to work went along the coast. I loved watching the seasons go by, the sun coming up or going down over the sea, the day getting darker or lighter depending on the time of the year. I also made train friends, which always made for an entertaining journey. Now my fellow bus commuters are school kids. I’ve purposely not bought a car, mainly because I know I’m going to get lazy and I do like my slender size 8. I also can’t afford a car and even if I could, I probably wouldn’t get one because the public transport here is fairly decent. And I have a bike. Besides, the roads around Oxford seem to confuse me. I’m not used to so many huge roundabouts and dual carriageways – and I consider myself a good driver with a decent sense of direction. The parking charges in the city are horrific. The car park near Oxford Castle was £3.50 for an hour. If we were not stationary, my dad would have crashed the car! The alternative is the park and ride scheme. Park your car in any of the five locations on the outskirts of the city, and catch the bus into town. The charges range from free to around £1.70 for the day. One way into the city by bus is generally around £1.80. Oxford, of course, is known for bikes. Cycle routes are everywhere. In fact, it’s probably the best way to get around. 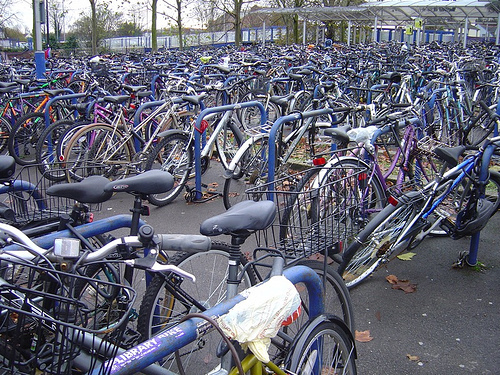 It’s a still a sight for me to see loads of bikes parked at the train station. Slowly I’m discovering the city on two wheels. As part of my training for my up coming London to Brighton bike ride for the British Heart Foundation I’ve been cycling along the Thames Pathway. I just happened to be in Limehouse, London on Wednesday and found the end of the trail. I got very excited that I found the end! For me, I’m finding Oxford easy to get around sans automobile. If only my hometown would follow suit! Yesterday was a weird day. I was at the back of the room listening to a middle-aged woman trying to rap an apology to me. She hadn’t done anything wrong. She was rapping on behalf of an inmate at Lewes Prison. I was part of the Sycamore Tree Project – a six-week victim awareness course which aims to create a dialogue between ‘victims’ and offenders. For the victim – I hate the word victim. The word ‘aggrieved’ is more appropriate – the project provides a voice and an opportunity to tell those who matter – the offenders – how they really feel. For the offender – it is a chance to say sorry and to hear how crime affects people firsthand. I heard about restorative justice on Radio 4. The whole point of prisons is punishment, with the idea that the prisoners won’t re-offend. The reality is, prison doesn’t work and our prisons are full. According to the Prison Reform Trust, 49% of adults re-offend within one year of their release, and for those whose sentence is one year or less, that figure increases to 61%. For the criminals who have served 10 custodial sentences or more, the rate of re-offending is 79%. The National Audit Office estimates that it costs us between £9-£13bn a year. If there was another, but proven way to tackle this issue of crime and re-offending, then I’m all for it – in theory. I never thought that it would turn into reality. After my nasty car accident last May, I asked Sussex Police if I could meet the Moron who drove into me and my friend. All I wanted to ask was why, and for Moron to take responsibility. I also wanted to show him that I wasn’t ‘29 year-old woman passenger in a black Mini’, which was how I was reported in the papers. Unfortunately for me, Moron wasn’t interested, and that’s when Sussex Police told me about the Sycamore Tree Project at Lewes Prison. It was the first time I’d ever been in a prison. I waited nervously for the 20 or so men to file into the room. It was week three, when the aggrieved talks directly to the prisoners. It was the first time they had heard from someone who was directly affected by crime, and although my situation was unrelated to them, it had a profound affect on some. For the others – they didn’t care. It was insightful. I had tried not to let the car accident affect me. After all, I walked away from the wreckage scot-free with all but a scar and a lot of bruising. I realised that I was angry. Very angry in fact. I didn’t realise until one of the offenders pointed it out to me. I swore, I cried, I didn’t hold back. I spoke for about 15 mins, after which, the prisoners asked questions. The offenders had workbooks to complete, where they retold my story in their own words, write down who else was affected, then decide who was affected by their crime. I have to admit, that was a little strange. In week six, I was invited to come back. This session was about making amends and moving on. I had no idea if anyone would listen to what I said. After all, some were there because they wanted too, while the others were on the course because it was part of their sentence. I was surprised. I had a letter written to me, which was read out, another wrote a rap and someone else decided to carve sorry out of wood. The point here is that I didn’t ask them to do this. They were compelled to do this themselves. I spoke to the bloke who wrote the letter to me. He had also written to his partner, who he had punched after catching her in bed with his best friend. He had spent 20 years in and out of prison for various offences, but he told me that after hearing me speak, was the first time he had felt pain. He knew he wasted a lot of his life and decided that this wasn’t a life for him. Another chap told me that once he was out, he won’t be dealing in drugs again. He didn’t realise the impact that he had. Moron was chased by the police because he was stopped at a KFC for going out the entrance, and for suspicion of drugs. I suspect it was pot – only because you can smell it. And as me and this chap were from the same area, he could have supplied the drugs, which led to the chase. We will never know. The Restorative Justice Council says that if restorative justice was offered, it would save £185m over two years. But more importantly, it would reduce the re-offending rate by 27%, and although this doesn’t seem a lot, it does mean less crime and less victims. In case you were wondering – Moron got 20 months community service, with a nine month suspension and a driving ban. Ironic really, seeing as he didn’t have a driving license in the first place. I’ve come back from Nepal slightly jaded from the hustle and bustle of Kathmandu. As a tourist, you are constantly bombarded by shop owners and street sellers trying to get you to buy something. You step into their shop, you get the hard sell. You walk down the street, someone follows you asking you to buy tiger balm. Someone asks if they can push your trolley at the airport because you’re limping, they ask for a tip. Someone wants something, and it comes at a price. You accept this. It’s a way of life and like us all, they’re trying to earn a crust, Unfortunately, it left me skeptical of anyone asking if I needed help or generally being kind. Having been caught in a strike for five hours at somewhere between Pokhara and Tansen, I, along with three other travellers were deposited on the main road in Lumbini – the birthplace of Buddha after being on the road for 15 hours. It was pitch black – they were load shedding at the time – and there was no one about. After 10 mins of walking down a dark, but wide dirt track, we realised that none of us knew where the Korean Monastery was – our bed for the night. Scratching our heads at a junction, a motorbike sped past, then came back. A man got off the back and asked us where we were going. It was obvious that we were lost. He then phoned a taxi, and waited until it came, before carrying on to their destination. Back at home, I was taking a very early train from the Sussex coast to Oxford. A family of five (including two young children) boarded the train and were going to a 40th birthday up in Crawley. Brash and loud, I upped the volume on my smartphone turned mp3 and tried to look inconspicuous. Then they started drinking (and before you ask – no – the kids weren’t drinking). It’s going to be a long journey, I thought. I considered moving, but I didn’t want to be rude, so I stayed put and watched the world go by though the window. The catering trolley came down, and I was desperate for a cup of tea. Unfortunately, all I had was a £20 note and 90p in change. The tea was £1.90. The catering lady didn’t have any change and I thought I would have to forfeit my tea. But then, the dad offered a £1 and I got my cuppa. It was a small act of kindness. After all, what’s a quid? But it restored (some) of my faith in humanity. When in need, people are there. I think we should celebrate the kindness of strangers, no matter how small. What random act of kindness has a stranger done for you today? *In case you were wondering where you’ve heard this before, it’s from a line in Tennessee William’s A Streetcar Named Desire. “I have always depended on the kindness of strangers”. Most car crashes happen near to your home. In fact, nearly a third of crashes happen less than a mile away. Most are minor scrapes such as driving into a parked car or reversing into a wall. However, I had no such luck. Just one mile away from my house, a moron decided to collide into my friend’s car. One night’s stay at my local hospital, and three weeks of work, I think I’m ok. Needless to say, both cars were a right-off. Moron, who ran away from crash while myself and my friend were unconscious, was arrested on suspicion of dangerous driving and failing to stop. The next day we found ourselves in the local newspapers, The Argus and Bexhill Observer. Thankfully we walked away from the crash. I suffered bruising to by legs and my internal organs, which was a very odd feeling indeed. I was also unable to eat without feeling sick. That was worse than suffering from the deep bruising. Oh and the headaches. They are not fun at all. This dear readers, is the reason I have been so quiet over the past three weeks. Both my weekly blog posts and daily photo challenge has gone to pot, but I am hoping that after a brief break, I will be able to continue. So I finally found Southern Rail’s real Twitter account – not that I was looking, mind. I’ve been following their alias @Southern_Trains for a while. Their tweets light up my somewhat miserable journey. It also reminds to me that other people are suffering more hellish journeys than me. Today’s return journey, the 5.09 from the Sunshine Coast to God’s Waiting Room-on-Sea consisted of a foul-smelling bin, more prams, no air con and no seat. Joy. The smelly bin now means were officially in summer. All this for a princely sum of 73.80. What I don’t understand is the 5.09 on a Friday is always busy. The 8.22 from God’s Waiting Room-on-Sea to the Sunshine Coast is always busy. Why not put more carriages on? I posed the question to @SouthernRailUK. To be fair, the staff at my little station at God’s Waiting Room-on-Sea are good. One kindly told me that if I paid until the station after my stop, it was actually cheaper. Odd pricing, but hey, if it saves me pennies… The station itself is spotless and the staff are friendly. All in all, the trains are usually on time. Here’s my post on trains and the snow last year. For the next instalment on my retrospective world travel is the next leg of my trip – Mongolia to China. After spending two amazing months in the landlocked country, I spent the next 30 days training it though China. I walked part of the Great Wall of China, trained at a kung-fu school, got very sick and ended up in hospital, saw baby pandas and took a boat ride down the Yangzi River before getting into Hong Kong. Last August saw traffic jam last nine-day that spanned 100km in Beijing. Nine days?! Thankfully I didn’t get caught up in that. But it was a culture shock. Within the first few days, I had a Big Mac from MacDonald’s and regretted the first bite. Yes another country, another language. I have my LP Mandarin phrasebook, so am determined to learn something. I took the local train in Beijing which took two days. surprisingly it was ok. The Mongolian part was just like being on the Trans Mongolian, but the Chinese train had 6 beds, instead of the four. I met a few people from UB, and we ended up getting drunk on vodka. True Mongolian stylee. No hangover for me, although I did sleep in late and missed seeing the Gobi Desert at 5am. The window was open so I got covered in the sand though. I’m in central China now, in a grey city called Zhengzou. Yes another city, and I’m a bit fed up with all the rush and the fact that I can’t seem to launch Yahoo music. Damn you streaming error code 14 – 80040241, whatever the bloody hell that means. I took another night train. I’ve decided that I’d rather sleep for 8 hours whilst travelling at night than sit and watch the world go by and being board for 8 hours. Short distances are ok, but China is rather large. Beijing is a massive city, especially when you’re used to UB, where everything is down one road. surprisingly it is more expensive than Shanghai, which means another two Chinese style tops will be made there. So, the reason why I’m in grey Zhengzhou was to get to a place called Song Shan to train at one of the oldest and largest kung fu school in the area. The Shaolin Temple was not far from where I was, and the school has at least 7000 students. That is 7000, all fighting, all screaming little Bruce Lee machines. I would walk around the school and though the playground where all the little children would be practicing their moves and playing with their swords. They are good! They are very good. I was training with some other Westerners, one had been there a year already, another had done 3 months last year, and is spending 5 months this year. We were sharing with a class of Taekwondo, who are a bit mad. When the girls scream (its to frighten the opponent and using the force of chi) they sound like scary banshees. I trained 6 hours a day, and now I now longer punch like a girl. W-hoo. surprisingly I’m not as stiff I thought I would be, but then I did lots of stretching today, cos i knew I’d be walking around with my backpack. The stretching was just as hard as the actual martial arts, but they were really good, at making sure you stretched out properly. It is so easy to hurt yourself! Getting up in the mornings were a bit of a mission, especially when your legs don’t want to move. So, yesterday was A Good Day. Well, apart from losing my credit card, and now realising that I have to phone England to let them know, even though I’ve emailed them, which I know will cost a bomb ‘cos of the bloody automatic voices and cheesy music they play down the line knowing how much a min they’re charging me. I hired out bikes and cycled through the rice fields with a bloke called Andreas. It was great and the views were stunning.Unfortunately the houses in the villages were getting rebuilt to be modern looking, which just reminds me of how quickly China wants to modernise itself to compete with the Western world. However, once you turned your back, it epitomised my vision of the Chinese countryside; rice fields, mountains, women walking their cows with the typical Chinese hat and the sun beating down. The most important thing for me was the quietness of it all with only the wildlife making sounds and the air being so clean. I’ve never smelt fresh rice before and I loved it. The rice back home is always in packaging, so it was nice to see them in their natural state. Speaking of which, down here is real Chinese food, as in having snake blood with vodka after eating the snake, having dogs reared for food, then chopping them up just like a pig. Some people have a hard time, but think about it, we eat cow etc, so its not really different. Ok – so I’m not laughing now. Well, not at the the situation the snow has put people in. My train was suspended this morning, so it was another day of working from home. But you have to feel for the people who were stranded at Three Bridges last night. They ended up sleeping on the carriages because it was warmer than standing on the platform. Read the story here. Today, the Transport Secretary, Philip Hammond was told to “get a grip ” on the snow situation. However, didn’t we have a similar situation last year? Ok, so this year is much worse (that’s what we said last year), so why is the country at a standstill…again? It’s not the grit this time, but, according to the AA, it’s the “lack of resilience” of the UK’s infrastructure. AA president Edmund King said: “We might have more salt than last year but we need better planning to allow gritters through heavy traffic and blocked roads. “Some highway authorities have invested in new gritters but again we hear that farmers offering to use tractors as snow ploughs were prevented from doing so as the insurance had not come through. This is not good enough.” Read the full story here. We knew the snow was coming. We knew the situation from last year. So why were all the trains suspended on the Southern network? I’ve lived in Austria. Snow is the norm. I don’t ever remember any of the transport being suspended. We have been experiencing extreme forms of weather for a good few years now and 2010 has been the hottest year on record. We have to accept that this is going to happen, year in and year out and we need to, as a country, be prepared. And come January, the cost of train tickets will be going up (above the rate of inflation I believe). I’ll save that rant for another day. It has been claimed that the snow is costing the economy £1.2 billion a day. I’ve been thinking, how much would it cost to invest in decent snow equipment? Would the investment not counteract the loss? But then, the next question would be, where would the money come from? And no-one has started talking about the potholes yet. They’re still patching up from last year. By the way – I love the snow.